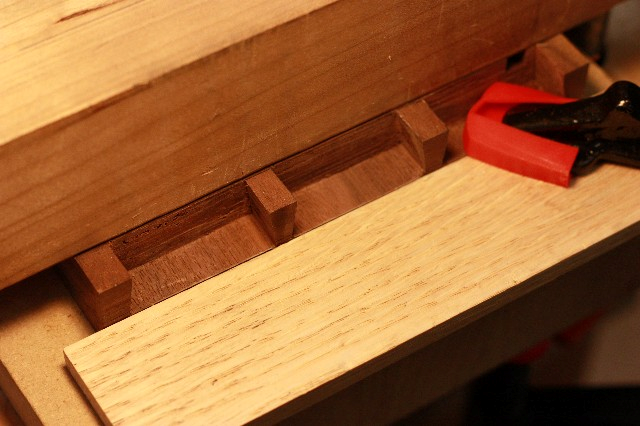 I certainly like the way my dovetail sockets cleaned up. Used the card scraper to sever the fibers and the shim to pare out the bottom of the socket. Worked well for me. I've never used a shim like that, but it looks like a great tip. Thanks! Your welcome! It really helped me. I bought a cheap paint scraper the other day with the intent to try using it for this same trick. And also for marking dovetails (I go tails first) but haven't had a chance to use it.Yours turned out well, great work. Thanks so much!I go tails first as well. Eager to hear how it works for you. I oriented the board vertically and clamped the outside. Don't want to break the anything. Nice job Marilyn! I can't wait to see this come together. I'm sooooo close .. and this week is going to be tuff to get any work done. Sigh!